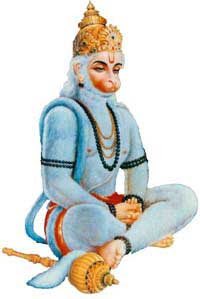 Bada Mangal, dedicated to Lord Hanuman, is observed on Tuesdays in the month of Jyeshta (May – June) as per the traditional Hindu calendar followed in North India. Bada Mangal is mainly observed in Lucknow in Uttar Pradesh and nearby regions. The origin of the festival is traced to the Naya Hanuman Mandir at Aliganj in Lucknow. Bada Mangal is the name for more specifically used to describe the first Tuesday in the month of Jayeshta or Jeth. A big fair is organized in the region during the period. The fair and the festival is believed to be more than 400 years old. There are numerous theories regarding the origin of the Bada Mangal fair. One legend suggests that the child of the Nawab of the region fell ill and doctors were unable to cure the child. The wife of the Nawab took the child to different places in the hope of find a solution to the child’s illness. One day during her search she met the priest of the Naya Hanuman Mandir at Aliganj. The priest asked her to leave the child before the Hanuman idol in the temple and come back later. With the blessings of Lord Hanuman, the child recovered. The mother could not believe her eyes. The wife of the Nawab wanted to make an offering at the temple. The priest suggested that instead of making an offering it would be better if she could arrange a fair here as it would lead to the economic prosperity of the region. Since then the tradition of observing Bada Mangal is followed and it attracts thousands of people.